Today we were all saddened with the formal news we had all feared, the death of Kayla Mueller at the hands of her ISIS captors. This was a young woman who went to Syria because she wanted to aid in relieving the suffering of the Syrian people at the hands of their corrupt leaders. Today we saw statements form Kayla’s friends and family and their pain was hard to watch. All America stands with her family in their grief and mourns the loss of a very special life far too soon. This comes just over a week after the posting of ISIS Burning captured Jordanian Pilot Moaz al-Kasasbeh was announced by the Islamofascist group. 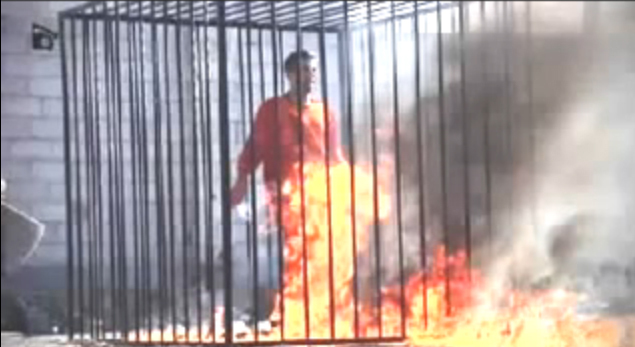 Moral relativists would tell you we need to understand why ISIS would be led to perform such atrocities. The truth is much simpler; ISIS and its Islamofascist philosophy are the face of pure evil in the world today. After much thought a screen capture from that video of the insane slaughter of the pilot has been included with this post as it is important to see what ISIS has done. In performing such acts the killings of Kayla and Moaz the Islamofascists have surrendered any claim to humanity they had. They are a cancerous growth on humanity and like any malignancy, they must be eliminated. The reality is we will see more such acts, and given ISIS’s progression towards increasingly sadistic acts, the worst is yet to come. What is equally starling are the differences in our two nation’s responses. 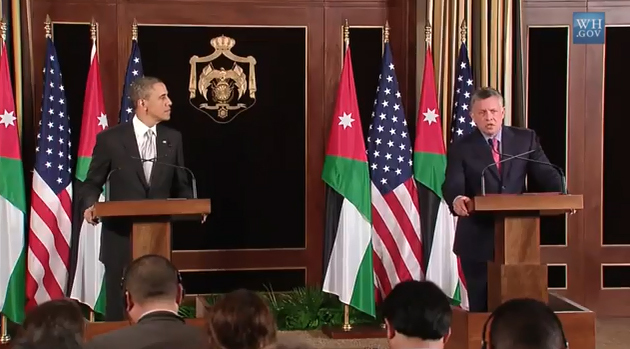 King Abdullah II of Jordan pledged to wage war and wipe the ISIS infestation off the face of the planet. Spending much of his time since the execution became public with his troops, he has said ‘The only problem we’re going to have is running out of fuel and bullets.’ True leaders lead and can come from any nation great or small. Jordan is fortunate to be lead by a courageous leader and his time in history is now. Contrast that with comments made by President Barack Obama at the National Prayer Breakfast when he compared the atrocities of Islamofascists with the acts of Christian crusaders more than 500 years ago. The Democrat administration continues to use the minimum amount of force needed to keep the American people and their representatives in congress from removing the decision from his failed Presidency. The world should have no misunderstanding; Barack Obama does not speak for the majority of the American people. He has abdicated that responsibility. We are past the point of taking legal or legislative action against President Obama; he is a lame duck and will be on the stage for less than 2 years. Yet if left unchecked by Western Democracies ISIS will morph during that period into something even more depraved than it is today. One act the Congress could take is to drop all discussions on Approval of Force resolutions and instead pass an unambiguous Declaration of War against ISIS and any state or group providing support. Even will all his arrogance, I suspect Barack Obama would realize vetoing the Declaration of War would be political suicide, assuming the Declaration was passed by less than a veto proof majority. It may be unpopular in some circles to say this, but President George W. Bush was right in that we are engaged in a multi generational struggle that will determine the very nature of humanity in the future. The responsibility lies with each and every one of us to ensure the scourge of Islamofascism is wiped from the face of the earth. The more we wait the more death and misery will be endured.